Welcome to the latest addition to our Sudoku family, the 3D Snowflake Star Sudoku, just in time for the festive season! As you'll see from the image at right, this attractive little puzzle makes the perfect Sudoku addition to any festive-themed puzzle page. Despite it's 3D nature, the rules of the game are reassuringly familiar to anyone who has played Sudoku before. Simply place the numbers from 1-8 once into each of the 4x2 bold-lined rectangles that compose this 3D snowflake Sudoku star puzzle (of which there are 12 in the grid). In addition, the numbers 1-8 must also be placed once into each of the rows that run around the puzzle grid, and the columns that run down them. 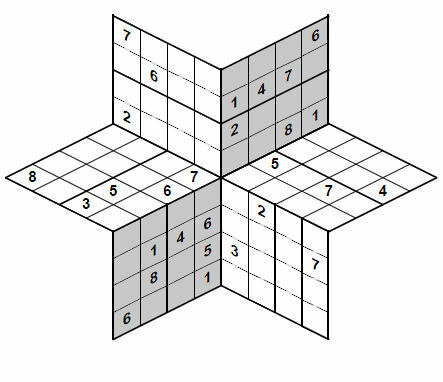 As with all our Sudoku puzzles, there is no need to guess when solving these 3D Sudoku puzzles, the trickiness infact doesn't come from the solving rules required for these, which we keep gentle, but getting used to navigating around the grid. If you'd like some 3D snowflake star Sudoku puzzles for your publication, please do just Contact Us to discuss your requirements. Do you like 3D Sudoku? Are there any other variants of this puzzle type that you particularly enjoy and would like to see? As ever please do let us know through the comments section below, we're always interested to hear your thoughts on anything puzzle-related!